How to build a dry-laid flagstone walkway is what we will be covering in this do-it yourself module. We will show you the necessary steps from start to finish on how to complete your project. Our goal at Dream-yard is to help you achieve your very own dream yard. With the same character and charm as a dry-laid flagstone patio and similar construction techniques, we move on to another module of landscaping with natural stone. Natural stone projects have often been considered the envy of the neighborhood. 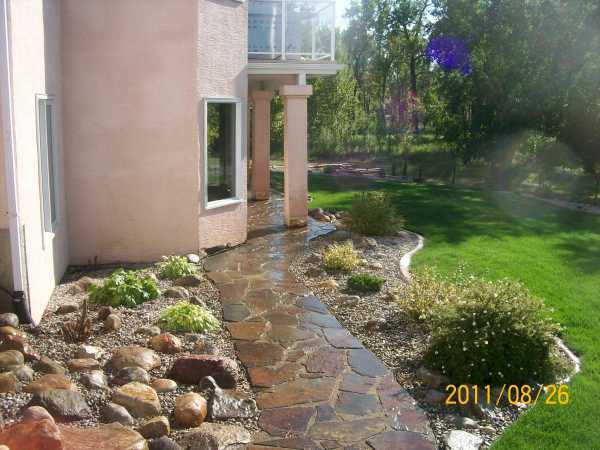 Now you can build your own beautiful dry-laid flagstone walkway saving hundreds, or even thousands of dollars. I have built many flagstone walkways and I love the feeling of accomplishment, and the joyous look on the customers face when the job is complete. It puts a smile on my face every time. We want to be able to pass on the skills, knowledge, and experience to give you the confidence to do what we do. This means all the money saving tips and techniques as well. As with most stone projects you don't need expensive equipment to do the job. Man has been working with stone for thousands of years without it accomplishing some amazing projects. You will need time, patience, old clothes and the willingness to learn. We always try to make our how-to's easy to read and follow so you don't have to invest in a library of books. If you do have any questions along the way you can contact us by using the contact us page. We would be glad to help you in any way we can. Landscape construction varies in different regions of the world based on the climate you live in, the availability, and cost of materials. With this in mind, we will also guide you on how to select proper materials, and ask the right questions with suppliers. This will be helpful to overcome some of the regional differences. We also encourage other professionals from the industry to contact us and pass on their tips and techniques that are relevant to the area they live in. We will add any relevant material we can. We have broken this down into different sections with an explanation for each one so lets get started, and remember to take lots of pictures of before, during, and after. We would be happy to post them in our ideas section for others to see. Let's get started with choosing your flagstone walkway site.